This will generate the database that you'll need to use in order to do this exercise (note that the database and script are only to be used for exercises published on this website, and may not be reused or distributed in any form without the prior written permission of Wise Owl). You get bonus points for indenting the various parts of your query, and sprinkling it with comments! 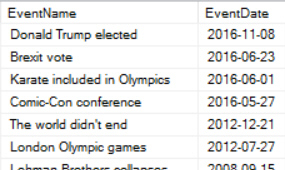 The first few events - the database stops at the end of 2016. Save this query as What a way to start.sql, then close it down.